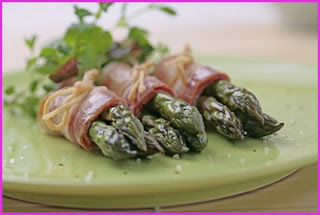 ~ RINSE the Asparagus, PEAL then TRIM the Ends, (the chewy part). ~ Depending on the Asparagus length, you should CUT each Spear in three. Set the Tips aside, (the tip is the most delicate part and should be handled with care). ~ Take 3 pieces and WRAP them with 1 Slice of Bacon, (if the slice is too long, Use Half). ~ TIGHT each Involtino with Cooking-String and BRUSH it with a bit of Olive Oil. Set aside. ~ HEAT a Cast-Iron Skillet to COLOR the Involtini on all sides and Serve(*). ~ (*) I like it Warm with the Asparagus still Raw but, after coloring, you could place the butch in an Moderate Hot oven, (190°C ~ 370°F ~ Gas-5), for about 10-minutes, and serve. ~ 2 Involtini per person should be a good start. 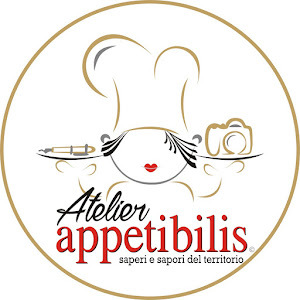 ~ In the picture I’ve used the Tips of green Asparagus from Altedo (Bologna), they are slimmer than the regular type. The Tips look good but you can use all the tender parts. ~ Tender left-over are great for a delicious Frittata/Omelette, Risotto, etc.